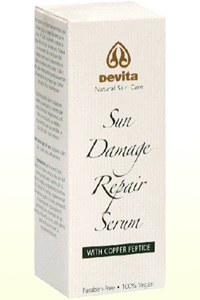 Sun damaged skin refers to skin that has been damaged over time by repeated exposure to the sun. Over time the sun can damage the cells of the skin and the melanin production which causes a range of issues – from uneven skin tone, to ‘sun spots’ in the form of brown marks and patches and blemishes, to a generally more wrinkled and even ‘leathery’ appearance. Of course prevention is better than cure, and the real way to combat sun damaged skin is to avoid exposing yourself to the sun too much from the beginning. However that’s all very well and good, but it’s not much use if you are someone who already has sun damaged skin – and decades ago we were not all as well educated on the potential hazards of continued sun exposure. Here then we will look at some ‘after the fact’ solutions – it isn’t too late! General maintenance of the skin will help you to minimize the appearance of sun damage. However there are also several over-the-counter products that are designed specifically to help reduce the appearance of sun damage. You shouldn’t expect miracles, but those products containing alpha hydroxy acids (glycolic acid, lactic acid etc.) can have a smoothing impact on the skin by peeling off the very top layers of the epidermis, and generally exfoliating can help too – but it’s important to combine this with sunblock as you will be revealing the lower and more vulnerable layers of the skin. Vitamin C preparations can moderately reverse the effects of sun damage too. Despite claims, antioxidants won’t help to reverse the appearance of sun damage but will rather only help to avoid it becoming significantly worse. Antioxidants work by combating free radicals which can also damage skin cells, but this won’t repair the damage that already exists. Also be careful of those that say they contain collagen – as this is generally too large a particle to get past the surface of the skin where it would be needed to do any good. If you decide to see a doctor about your skin damage they may be able to prescribe some creams and gels as well. These include tretinoin creams (the ‘acid form’ of vitamin A) which can help to thicken the epidermis and the dermis, and increase pigmentation through inhibition of the epidermal melanin content. Over many years this can also reduce some wrinkles. Mainly used for acne, tretinoin creams unfortunately do have some side effects including dryness, soreness, sensitivity to sunlight, redness, scaling, burning and itching among other problems. Again this actually increases the risk of sunburn so it is highly important that you modify your lifestyle while using these creams. Tazarotene is another product used in reversing sun damage which is also a vitamin A product which was originally used to treat psoriasis. However more study is required before it is routinely recommended for sun damage. As with other forms of skin damage there are various cosmetic treatments available to help treat sun damaged skin, which mostly revolve around removing the top layers of the skin in order to encourage regrowth. One option is to use a chemical peel which utilize glycolic acid preparations. These can peel only the very surface of the skin, or can go deep into the dermis depending on the severity of the case. However it is important to recognize the risks these carry – and the deeper the peel the more likely you are to damage the pigments of your skin or even cause scarring – which of course rather defeats the object if that should happen. The other option is laser surgery called ‘dermabrasion’, though this is becoming less popular, or ‘non-ablative laser surgery’ which is a newer development. Again this works by removing the top layer of the skin in order to encourage the production of collagen, and in order to help smooth skin tone and remove sun spots and wrinkles. Of course Botox and face lifts are also options available for reducing fine lines and wrinkles, though they both come with side effects and weaknesses, and Botox is only a temporary solution that needs regularly ‘topping up’. Sun damaged skin is caused by overexposure to the sun over a long duration of time and often repeated sunburn. Preventing sunburn then by covering up and using sunblock, and being careful in the sun is one of the best ways to avoid sun damaged skin and also one of the best ways to avoid it becoming worse. Sunburn can range from a mild ‘redness’ to severe third degree burns which can be very painful and also do a lot of damage to your skin. By treating sunburn as it happens, you can help improve the quality of your skin and its appearance when you are older, and also help to prevent skin cancer and other serious issues. If you should suffer from sun damage, here is how you can go about treating it and improving it. First of all you should remove yourself from the sun in order to prevent further damage. If you are unable to do so then you should at least attempt to cover the area that is burning – wear a hat for instance or put on a thicker jumper. It might not necessarily be comfortable, but it will help you from damaging your skin further. From here you should attempt to avoid direct exposure to the sun for a while – keep yourself wrapped up when you go outside and don’t sunbathe again for a while – at least until your skin has stopped hurting. Most important is to moisturize now to replenish the essential minerals and nutrients that you will have lost. You can get creams specifically for this task that contain all the nutrients that your skin requires for this. Look for ‘after-sun’ and this will help to treat your skin at the time and prevent tightness while aiding in recovery. Of course if it’s too late to prevent sun damaged skin, and if you don’t want to take any of the more extreme routes to recovery, then you are left having to hide the damage which can be achieved through the smart use of makeup – concealers, foundations and even fake tans can all help to reduce the appearance of sun damage.